Years ago, I saw a photo of a high alp mountain hotel. It looked like it had welcomed guests to its corner of the Alps for a century or more. Weather beaten pine boards showed the consequences of facing mountain storms over many years. In reality, the look wasn’t all that unusual for the Swiss Alps, whose nooks and crannies hold many beautiful weathered works of long gone craftsmen. This building was unique in one way, however. It was literally anchored to the side of a cliff. When you see it in a photo for the first time, it’s hard to take your eye off the image. The building is the Berggasthaus Aescher-Wildkirchli, and it’s located in the Alpstein, a small, tightly packed range of peaks in Switzerland’s Appenzell canton, barely more than a day hike from Germany, Austria and Liechtenstein. Finally, this summer, I got a chance to see the Aescher in person. Approaching the Berggasthaus Aescher-Wildkirchli, a dozen years or more after first seeing a photo of the Alpstein mountain lodge. The Berggasthaus Aescher is not the least bit out of place in the Alpstein. The range has a way of banging you over the head with one surprise after another. One moment you’re climbing a ladder up a chimney… the next, you’re running along a high alp pasture. A few minutes later, your attention is absorbed by the layers of ridges woven into the horizon… then you’re transfixed by the arête one valley over, whose fins, like the Aescher, are a bold statement against the forces of gravity. I came here with friends Dan and Janine Patitucci, outdoor photographers and athletes who have crafted what seems to me to be a nearly ideal life, living, playing and working in the mountains. This trip was a great example: part work, photographing for outdoor gear manufacturers… and plenty of play along the way. 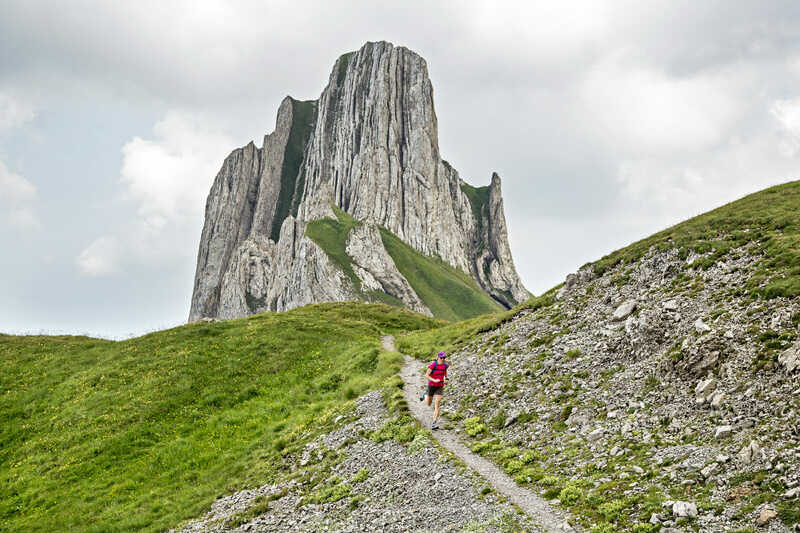 The Alpstein is challenging trail running. There’s no cruising through bucolic pastures for kilometer after kilometer, here. Nature always seems to ask for effort from those determined to see special places. The Alpstein is another piece of evidence that the rewards are more than worth the effort. I‘ve written more about the Alpstein, but I’ll save that for another time. Besides, there’s a better way to explain it. I’ll step to aside and let Dan and Janine’s images speak for themselves. And yea, to answer your question, it was absolutely just as cool as it looks. Great article and fantastic pics.